Students are thriving on Principia’s robust, experiential approach to learning! This was evident recently at two evenings of presentations by Upper and Middle School students. Making learning and understanding “visible” is an essential element of the School’s approach to “teaching for understanding.” That visibility occurs in two main ways: displaying student work in the classrooms and hallways throughout the semester and hosting specific events at which students present, discuss, explain, and engage visitors in their academic journey. 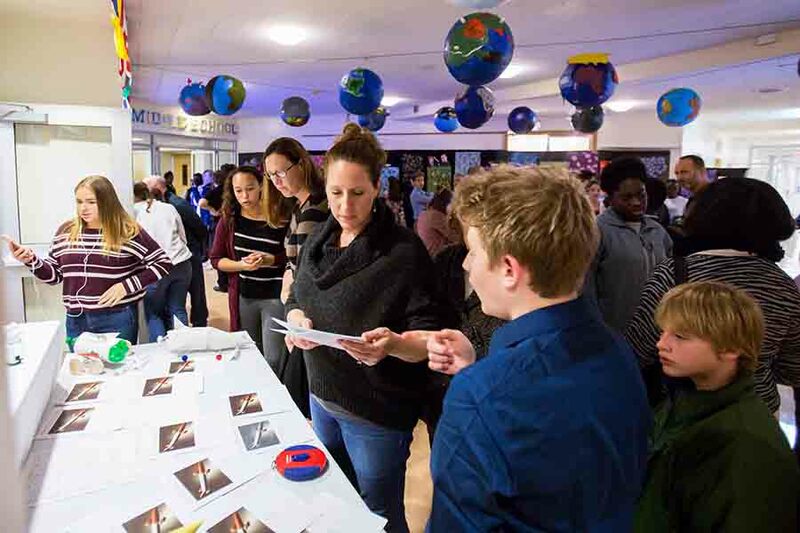 In early November, a reformatted and focused Upper School Excellence in Action program allowed parents and family members to delve into the depth and variety of learning that takes place in just two periods of the school day. The subjects covered in those two periods run the gamut—from the performing arts to science, from literature and language to social studies, and a whole range of electives. The evening started off in Ridgway with a rousing performance by the jazz band and choir, after which visitors dropped in on different classes. In some of those, students gave prepared presentations; in others, they undertook experiments or in-class activities that invited parent participation. Each step of the way, they responded to questions from curious visitors about content as well as process and next steps. Occasionally, students share their work beyond campus borders. That was the case this past Monday, when freshmen in the Entrepreneurship class presented their business ideas in a Shark Tank-style format to a panel of judges that included Principia alumni and other business people. The winning business concept was a colorful, fabric-covered backpack organizer for keeping papers, pens, and other items neat and easily accessible. Second place went to a team who created beautiful bracelets, for which 50 percent of the sales price could be donated to a charity of the buyer’s choice. Soaps, scents, and an app were among the other business ideas.